NEOEA | 31,000 members working for Great Public Schools for every northeastern Ohio learner. NEA has kindly arranged for delegates to use room W208C for a prayer service on July 5, starting fifteen minutes after adjournment for the day. Unfortunately, we learned rather late that arrangements for a priest to celebrate Mass at the Convention Center were unsuccessful. Our delegates have been invited to join the congregation at the Basilica of Mary, Queen of the Universe, at their 6:00 PM Mass on July 5. The most likely means of transportation is taxi or private car, and routing systems suggest allowing a minimum of 20 minutes to get there. The address is 8300 Vineland Avenue, Orlando, Florida 32821. Each year we gather our delegates for a class photo. Here’s the 2015 version. If you’re a delegate and you think we didn’t get you at your best, let us know at desk@neoea.org and we’ll arrange for you to look through the outtakes. Tonight, four Ohio district associations—Central, ECOEA, NEOEA, and SWOEA—are collaborating on an Ohio Districts Night at Treasure Tavern. Dinner and the show begin at 8:00. We have arranged transportation to Treasure Tavern beginning at 6:45. Those of you attending the event should go to the regular bus pickup spot. André Prenoveau and transportation staff will send buses as they fill. The last bus will leave the Sheraton at 7:15 or when it’s full. The four groups will have leaders at Treasure Tavern to check you off on their lists, and you’ll get your ticket from your leader there. After you’re checked in, you’ll be able to enjoy a VIP reception and meet members of the cast before dinner and the show. The show is expected to end at 10:00, and our buses will be waiting to bring us back after the show. Please make sure that you get to a bus promptly, and if you’re not going to take the bus back please let one of your district leaders know. Highlight today – all OEA delegates participated in the FCPE Drive! 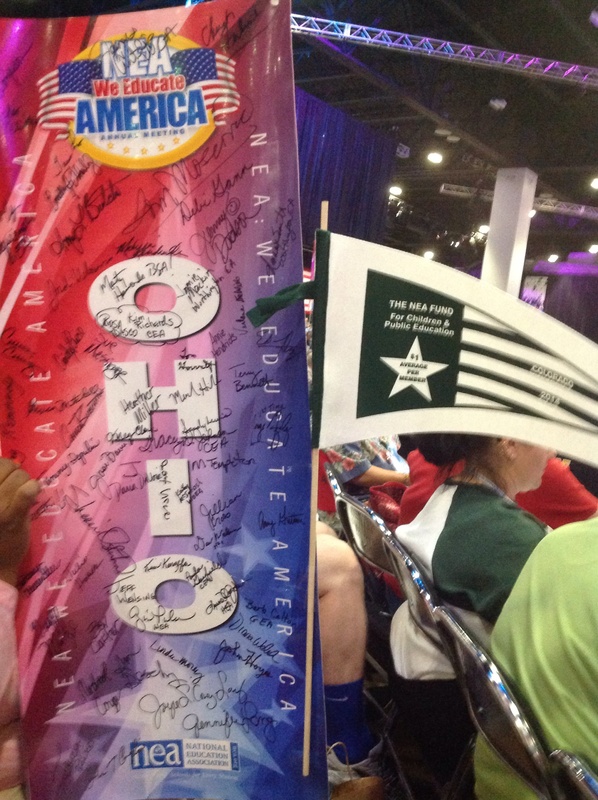 Ohio earned their flag for display on the floor. (See photo of state marker.) Delegates were very generous with their donations this year. Ohio was fifth for the highest amount of money collected for the fund. One of the action packed events of the last caucus is the live auction. Traditionally there are large ticket items that garner additional funds for FCPE. Among today’s auction items – tickets to Cedar Point and an overnight stay at Breakers Hotel, Blue Jacket tickets, OSU football tickets, handcrafted quilt using past OEA shirts, cowboy hats worn by the officers during the RA, along with a homemade authentic Mexican dinner. One of the district leaders is the auctioneer and about $6000 was raised. It is always so entertaining to watch the bidding wars. Everyone has noticed the team attitude exhibited by our current OEA officers – Becky, Scott and Tim. It is refreshing to have a group of individuals who are not only dedicated to the organization and our values, but also genuinely interested in every delegate and their views. There were standing ovations for the work they have done over the week. The last day is also filled with personal announcements about retirees from particular locals and kudos to the OEA staff who also works tirelessly on the behalf of delegates. By day four of early morning meetings and extended travel before the RA starts, everyone is really feeling the love for one another and our great union. The big question on the last day is when will the RA end. By policy, the delegation must complete all their work within four days. I have been at some RAs that adjourned close to midnight and others that ended around seven o’clock. This particular RA will see special tributes to the outgoing president, Dennis Van Roekle and motivating speeches from the three incoming officers.